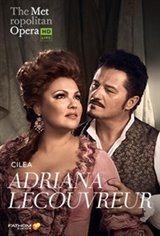 Fathom Events and the Metropolitan Opera present a broadcast of Cilea's Adriana Lecouvreur, live in select cinemas nationwide on Saturday, January 12. For the first time at the Met, Anna Netrebko sings the title role of Adriana Lecouvreur, the great 18th-century actress in love with the military hero Maurizio, sung by Piotr Becza?a. Gianandrea Noseda conducts Cilea's tragedy, directed by Sir David McVicar, with the action partially set in a working replica of a Baroque theater. The cast also features Anita Rachvelishvili as the Princess of Bouillon, Adriana's rival for Maurizio's affections, and Ambrogio Maestri as Michonnet.